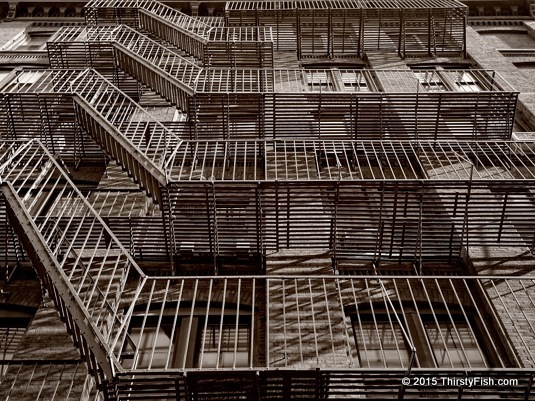 An exterior fire escape of a DUMBO, Brooklyn building. You might remember this 1976 Pulitzer Prize winning photograph "Fire Escape Collapse" of people falling from a collapsed fire escape. Arguably, it could be stated that most technology is born out of military ambitions. Computers, radio/television broadcasts, GPS and even synthetic fertilizers all had military applications before we put them to civilian use. Even the accidental discovery of penicillin by Scottish pharmacist Alexander Fleming had its roots in World War I. Eighty or so years after the introduction of antibiotics, we are now seeing superbugs resistant to all antimicrobial agents we have developed. There is no "fire escape". Will technology catch up, or will one strain of these superbugs wipe us out? Technology is not neutral when we've reached the point where one "failure" could mean an irrecoverable global catastrophe. It is delusional to think we'll come up with a "technological solution" to global warming "in the future", when technology and industry itself is responsible for it. I hope that I'll be proven wrong. We all know we're creating potentially catastrophic problems, but the fact is, you don't know, just as I don't know, whether we will come up with solutions to every threat technology is creating.